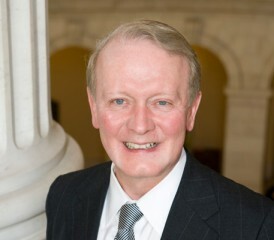 U.S. Rep. Leonard Lance stood proudly alongside cancer survivors and patients of rare diseases on Thursday as he promoted a new piece of legislation designed to speed the process of getting drugs and treatments for rare diseases from research labs into the hands of the public. Lance, a House Republican who represents New Jersey’s 7th District, was hailed by local advocates and national health groups for his efforts. The bill was recently introduced to the U.S. House of Representatives and is currently in front of the Health Subcommittee. During the news conference, Bonnie Anderson stood right behind the congressman. Anderson was diagnosed over 10 years ago with mesothelioma and was given a three-month life expectancy at the time. She was fortunate enough to beat the odds. Mesothelioma is one of the rare cancers that the proposed legislation will help. It is a cancer of the lining of the lungs that affects approximately 3,000 people every year and is primarily caused by asbestos exposure. Based on most scientific estimates, she is among 1 percent of mesothelioma patients who survive a decade with the disease. The new legislation will help millions of patients with rare diseases who strive to mirror Anderson’s success story. According to the congressman’s website, the bill is intended to “promote the development of meaningful treatments for patients with chronic or rare diseases.” This can have widespread benefits to the community of about 30 million Americans who are listed to be afflicted with one of the 7,000 rare diseases or disorders. The MODDERN Cures Act, if passed, would encourage the development of new drugs and treatments by rewarding efficiency and effectiveness. The acronym stems from Lance’s mission to “modernize our drug and diagnostics evaluation and regulatory network,” and is deemed MODDERN. From early descriptions of the proposed legislation, it appears to closely reflect concepts of the Food and Drug Administration’s (FDA) Orphan Drug Act, which provides incentives to companies or organizations that develop treatments and drugs for rare diseases. The distinction between the two pieces of legislation is not entirely clear yet. During the event, Lance noted that the bill was constructed with assistance with the National Health Council. To supporters like Anderson, who already see the possible benefits of Lance’s efforts, any amount of additional legislation will help. Anderson can relate to all the issues that the bill is attempting to address. Initially she was misdiagnosed and was thought to have irritable bowel syndrome (IBS), but doctors later determined the correct diagnosis after learning about asbestos exposure. She experienced the plight of the deadly cancer and sympathizes with others. She is now actively involved in a mesothelioma group in her area. The MODDERN Cures Act also seems to be supported by biopharmaceutical companies and advocacy groups alike. John Crowley, CEO and chairman of Amicus Therapeutics, was present with Lance during the news conference. The potential diseases that will benefit from this bill are numerous and include diseases across the spectrum. Janet Palkewick was also present at the news conference. She was diagnosed with amyotrophic lateral sclerosis (ALS), also known as Lou Gehrig’s Disease, over 22 years ago. At the time, she was given a life expectancy of two to four years. Despite her ALS diagnosis, she is surviving strong, 22 years later. Unlike Palkewick and Anderson, many other patients of rare and chronic diseases are not as fortunate to survive so long. The hopeful sentiments surrounding this proposed bill was shared by many at the event and was also echoed by Dorine Gordon, President and CEO of The ALS Association Greater New York Chapter. Lance appeared to have struck a positive cord at the event with all who shared his vision. Through his partnership with the National Health Council on this bill, he received encouraging words from some within the organization. “Despite the roughly $80 billion spent annually on medical research and development, many conditions lack effective treatments. This bill will advance personalized medicine by getting the right medicines to the right people. It will ensure that science, not patent law, drives the development of new therapies,” said Eric Gasho of the National Health Council. For those distraught with rare diseases and disorders like mesothelioma, another ray of hope may soon shine bright if this piece of legislation is passed.